The link between the Family Cotarella and the world of wine has its origins in the Sixties, when Antonio and Comenico Cotarella, growers in Monterubiaglio, made the first winery to produce their own wine. The bothers Renzo and Riccardo Cotarella, both winemakers, grew up in a land of long winemaking traditions. 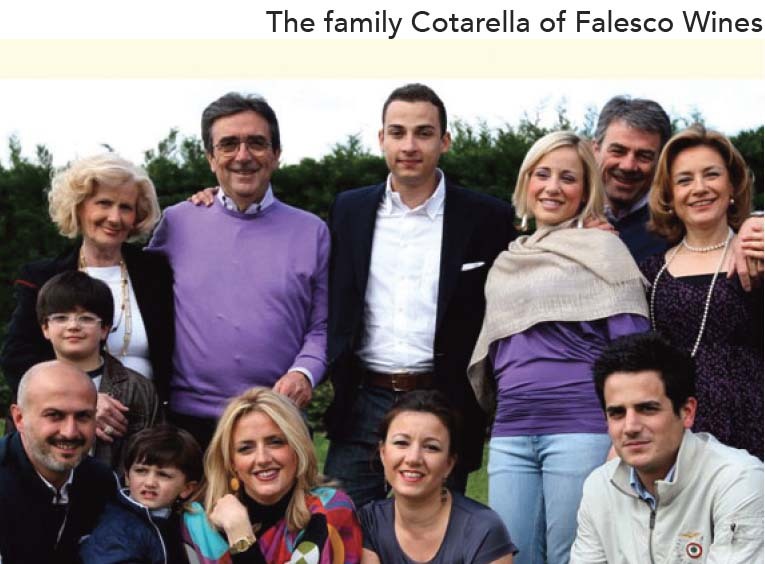 Driven by the passion of their father Domenico, they founded, in 1979, the current Falesco, turning what was a small family business into a successful company to leave to their future generations. In the family business, in fact, currently work their daughters Dominga, Marta, and Enrica, with the same enthusiasm and involvement of their fathers. Corete dei Papi estate covers an area of about 190 hectares between the towns of Paliano and Anagni in the heart of the production area of Cesanese del Piglio D.O.C.G. The estate is nestled in the hills resulting from the karst erosion that interested the area in prehistoric eras: this ancient geological origin makes the three hills of the estate and the surrounding landscape soft and very beautiful. The farm is named after one of the three hills, Colletonno, “Round” Hill, in the dialect of the area, surrounded by Colle Ticchio, covered by part of the homonymous wine vineyard and Colle Ricchezza, which is the old nickname given to the third hill for the generosity of the land. The most well-known of the Pallavicini families was that which flourished in the area comprising the cities of Parma, Piacenza, and Cremona; ruling for a long time over a large state of which the city of Busseto was capital. The branch of the Pallavicini family that established itself in Rome descended from the side of the family that had been settled in Genova since the 12th century. The Pallavicini family’s presence in the Latium territory since the 1600’s has seen personalities of prominent social importance alternate; a Pope, cardinals, art collectors, and the first Mayor of Rome. For centuries, the Pallavicini Princes have owned and run vast territories in Rome, Colonna, Gallicano, Cerveteri, Fondi, Pistola, and more recently in France. The Colonna Estate, in the Frascati DOC area, is the heart of production of Principe Pallavicini Wines. Here amongst vineyards, secular olive trees, seventeenth century farmhouses, and restored caverns, is where all phases of production of the premium red and white wines take place. 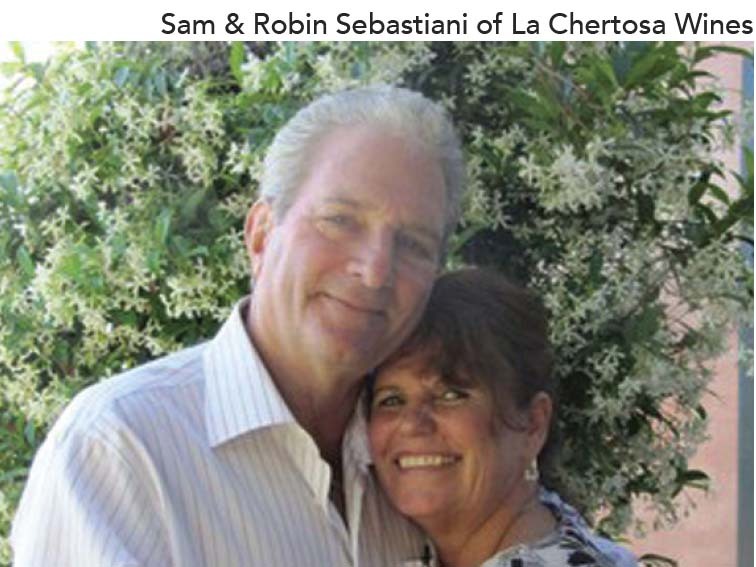 With their multiple award winning wines, La Chertosa is named for the magnificent 14th century Renaissance monastery in the Tuscan Valley of Farneta, Italy where the Sebastiani ancestral roots began. Here Sam’s grandfather Samuele Sabastiani learned to make wine in the “old World” style. 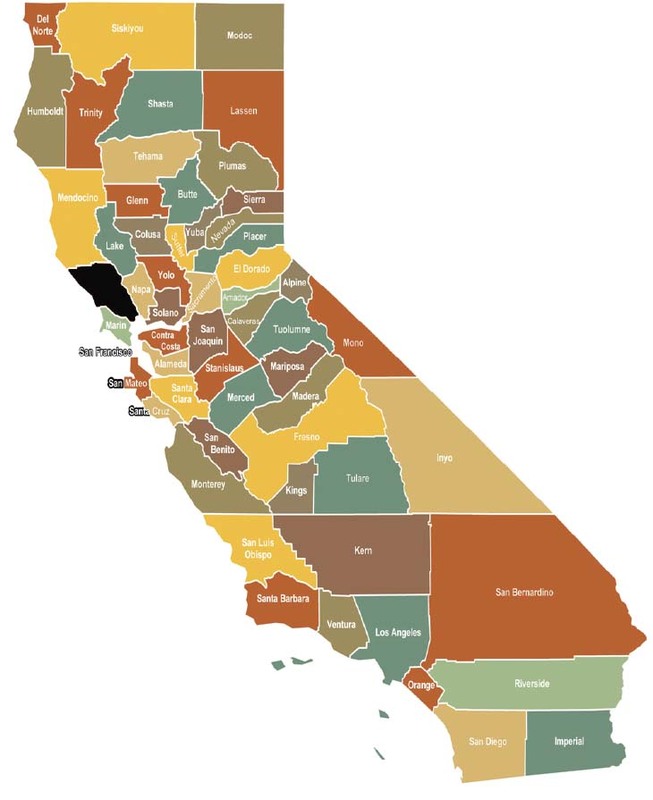 Samuele came to Sonoma in 1895 and found that Sonoma closely resembled faraway Farneta in three ways: a Mediterranean climate, red soils similar to Farneta, and blessed with gently sloping hillsides. Samuele planted grapevines, and in 1904 founded Sebastiani Winery, one of the first wineries in California. It was here that both son August and grandson Sam, learned the art of making wine in the Classic Old World style. “Old World” style encompasses all the instruments to blend and create a harmony of pleasing notes, a style which was much better understood by winemakers of the old world. Sam’s experience of 46 years as a winemaker and more that twenty visits to his family’s ancestral village have influenced his winemaking style, as taught to Samuele by Chertosinian monks. Hayes Family Wines both a relatively new family vineyard and winery, and one endowed with incredible experience in growing super premium grapes and crafting world-class wines. Brett Hayes, Marcus Schulz, and Andrew Seppelt draw on a combine 75 years of winemaking experience to craft wines sensitive to the site, the varieties and vintage at hand. Hayes Wines known for trying the new, for innovating, but not losing touch with the heritage nature of the their vineyards and the wonderful Barossa Valley wine industry. The trio’s vision is to take the best possible inputs, grapes, that have a special story to tell, handle them gently, and allow the wonderful patchwork Barossa vineyard terrior to express itself in the wines they produce. This wine received an Est!!! rating, as legend has it, by a traveling, wine-loving bishop. Delicate-straw yellow, with aromas of citrus, apple, and white flowers. On the palate, its crisp acidity is balanced with soft flavors of pear and melon, makes for an easy-to-drink, refreshing wine. Pairs with grilled fish, chicken satay, or oysters Rockefeller. Ruby red in color, tending to garnet with age. Bouquet of blackberry, dark cherry and plum, with a hint of herbaceous; the pallet will find a medium-bodied wine with a good balance and light tannins. Nice, long, rich finish. Excellent with pasta dishes, beef steak, and roasted meat. Bright straw yellow color with green reflections. Broad and intense nose with notes of blossoms, citrus and tropical fruit. On the palate it is full, well-rounded, soft with lingering fruity and fresh aftertaste. Serve with first courses, shellfish, white meat, and fresh cheeses. Deep purple in color. Sodale, Italian for solidarity, is redolent with inky black fruit, sweet spice, and mineral-all woven tightly together. On the palate, the wine is juicy with abundant tannin that is polished and supple in texture. Pair with your mid-week supper, a stuffed Portobello mushroom, slow-cooked Bolognese sauce, or a seared shell steak with frites. Deep ruby red colour with hints of garnet. The broad, ethery nose has typical notes of nutmeg, red rose, and spicy nuances. The name Amarasco refers to the typical aromas of the Cesanese grape variety. The palate has great thrust, but is balanced and mouth-filling, with a long finish. Deep ruby-red in color, with a wide range of aromas. One will smell vanilla, red berries, with layers of jam and sweet spice. It is powerful and full-bodied, yet well-rounded on the palate with an elegant and lingering finish. Pair with cassoulet or hearty casseroles, smoked beef or cured sausages, and roasted lamb with mint sauce. Ruby red color. The bouquet is intense and complex with notes of ripe fruits, leather, tobacco, and licorice. On the palate, it is rich, full-bodied, offering additional aromas of wild cherry, coffee bean and toasted oak. Ripe tannins and a lingering finish. Pair with cured meats and aged cheeses. Perfect for ragu, pasta dishes, grilled and roasted meats, stews, and braised beef. Lazio (Latium) is located halfway down the western side of the Italian peninsula. The Tyrrhenian Sea to the west provides cool breezes while the Apennine mountains guard the region from cold winds from the North. Lazio also has several sizable lakes. The soil is predominantly volcanic. Its capital and largest city is the national capital, Rome. With its millennia of history as one of the world’s most important cities, Rome is still the heart of Italy, and visitors to Lazio spend most of their time seeing the myriad monuments of the city. 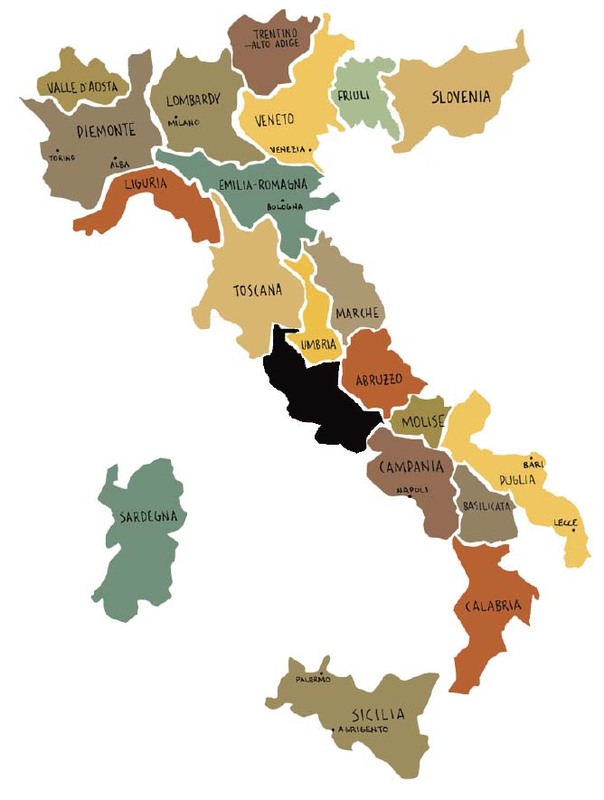 In the wine world, Lazio is best known for white wines such as Colli Albani, Est! Est!! Est!! !, and Frascati made in the local hills to supply Roman tables. It has 3 DOCGs, 27 DOCs, and 6 IGPs. In 2016 Lazio produced 1.5 million hl (16.9 million cases) of wine, almost three quarters of it white and about half at the DOP level. The region’s primary grape varieties are Malvasia (30%) and Trebbiano (28%). This is the only region where you can find modern production of an ancient wine once drank by the Romans, Falernum. Light straw in color. Aromas of pineapple, apples, and fresh baked bread. Hint of vanilla and cedar. Minimal tannins, medium-high acidity and very dry. Pineapple, green apple, lemon/lime on the palate. Serve with simple seafood, light chicken dishes, or salads. For the interested wine enthusiast our Quarry blend consists of Zinfandel as the primary grape (featuring hints of dark cherries and velvety tones) with Petite Syrah (for depth and backbone) and Barbera (to add texture and aging potential). Match with weightier, medium to full-bodied dishes, particularly those dishes that are grilled, braised and/ or smoked. Also pairs with spicier and salty dishes. Gold Medal winning wine. Brilliant gold color, full body, complex layer of flavors, well-balanced to toasty oak character. Smooth long finish. Pairs with seafood and chicken dishes. Light, fresh cheeses and first courses. 90% Sangiovese, 8% Petite Sirah, 4% Malbec. Double Gold Medal winner. Aromatics of spiced black cherry candy, blackberry, smoked blueberry. Flavors of black cherry cordial, chocolate covered cherry, summer forest, spice box, strawberry and cracked pepper. Perfect wine to pair with pasta dishes. Gold Medal winning wine. The 2015 Reserve Sangiovese is ruby-red in color, has balanced tannins and the aromas and flavors of slightly tart raspberry and cola. This wine pairs well with many foods and would be a welcome addition to any dinner party. Matches well with simpler, rustic dishes, particularly those that are grilled or roasted. Also pairs with hearty pasta dishes. Red raspberries and boysenberries with a hint of bakers’ chocolate on the nose. A big bowl of raspberries softly wrapped in tannins for a blueberry finish. Match with beef dishes including, Prime Rib, New York steaks with gorgonzola, lamb dishes and wild game. Multiple Gold Medal Winner. Medium-full bodied, garnet in color with bright acidity. Flavors and aromas of ripe black cherries, black fig, raspberries, and cacao-moderate tannin with a satin finish. Pairs well with rustic terrine, a big burrito, or your favorite charcuterie. 2 slices whole wheat bread, buttered and cubed. Steam or boil eggplant in salted water until tender, approx. 5 minutes In oil, saute onion and green pepper for 2 min. Add garlic. Saute 2 min. longer. Stir in eggplant, bread cubes, eggs, and seasonings. Spoon into a buttered 1-quart baking dish Bake at 350 degrees, until lightly browned. Pour a glass of red wine and enjoy! Peel pears and cut in half. Core from the blossom end, leaving stems intact. Insert cloves in bottom of each pear and half a cinnamon stick in cavity. Place in shallow baking dish. Pour in wine. Sprinkle with sugar and lemon rind. Bake covered at 400 degrees for 10 minutes basting and turning a few times. Uncover. Bake an additional 10 to 15 minutes. Serve hot or cold, spooning wine over the pears.